Today, when you order "John George LIVE", you'll instantly be emailed a Penguin Magic gift certificate. You can spend it on anything you like at Penguin, just like cash. Just complete your order as normal, and within seconds you'll get an email with your gift certificate. 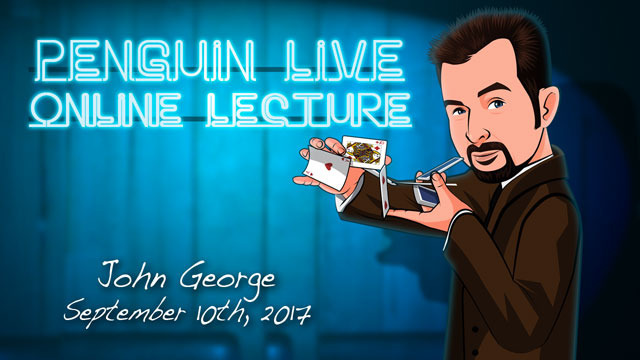 John George LIVE (Penguin LIVE) The entire award-winning competition act and more from an International Champion of Magic. SUPPORT LIVE MAGIC. DOWNLOAD THE FULL LECTURE TODAY. Olive Martini Opener This is just a bit of business not a trick. Martini and Olive. Coin Opener Production of a silver dollar size coin that leads into a jumbo coin routine that concludes with a production of a handful of gold. Pool Cue, Giant Olive, Grey Goose Wand vanish and reproduction, production of jumbo olive and a toy grey goose. Ace Ace Ace Ace Four ace production. 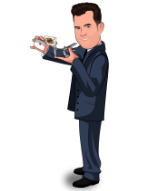 The award-winning, highly sought-after John George is a master entertainer who deftly engages audiences with hilarious jokes and friendly banter while dazzling them with his dexterity and technical skill in illusions and sleight-of-hand magic. The result is a funny, entertaining and unforgettable experience that explains why he’s so beloved by magic fans everywhere. John George travels the world starring in his own action-packed performances at corporate /private and public events, and at exclusive venues such as the world-famous Magic Castle in Los Angeles. John George also performs as part of the two-man team The Magical Misfits. At a John George show, expect to be challenged — and to not always trust your eyes! A-listers who have been to a John George show include Sir Paul McCartney, Francis Ford Coppola, Nicolas Cage, Meryl Streep, Jane Fonda, Jason Alexander, Cameron Diaz, Kirsten Dunst and Drew Barrymore. Also, John George counts major corporations such as Nike, ESPN, Absolut, Hilton, Toyota, Pepsi, Mattel and X-Games among his top-tier-only clientele. John George can turn a stuffed toy lion into a living, breathing animal and make a table float across the stage purely on the power of his command. The world-class magician, an expert in sleight of hand—the most difficult magic to learn—is recognized by his peers as one of the top and most talented in the industry. Among the coveted awards John George has won are first place in the International Brotherhood of Magicians’ Gold Cups Competition and the Society of Magicians’ Gold Medal Competition, and he was awarded Most Innovative by the Pacific Coast Association of Magicians. John George fell in love with magic as a child, and learned his first trick from his father, a hobbyist magician who worked at Disneyland in California. On one of John George’s frequent trips to Disneyland, he met the park’s longtime magician, Dana Daniels, his idol. John George also was an apprentice of famous prop builder Carl Williams, best known for his exquisite props for famous magicians David Copperfield, Lance Burton and Doug Henning. Under Williams, John George learned the valuable skill of how to build unique pieces — an element that sets him apart from other magicians and shows. Years later, as he was learning the tricks of the trade, he landed his first dream job: as a magician at Disneyland. For a few years, he was one of only two official magicians—the other was John George’s mentor and world champion Johnny Ace Palmer—at the park. Today, John George takes his show around the globe, dazzling audiences everywhere in the United States from San Diego and Orange County to such far-flung locales as Ireland and Jamaica. 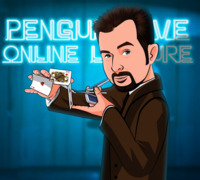 On Sunday, September 10th, anytime after 12:00pm Eastern, click the MyPenguinMagic area at the top of the Penguin site. You'll see the "learn" button appear next to this lecture. This is a lecture where if you don't do any of the effects'which are very good bye the way"Just his advice on routining and how to put together a killer act is worth the lecture.plus there is great advice on resteraunt magic. John George is an amazingly talented performer with a great sense of practical effects in real world situations. Great incite on routining, timing and subtleties on the psychology of movement. Fantastic for all levels and lovers of sleight of hand. entertaining and great lecture. Another which wanted me to see more from this performer. Not only learn great close up effects, but also how to tie them all together and strive to do the same for your own show. Cube work was great also! John George doesn't just tell you how he does his act. He tells you why and the journey it took to get there. This lecture is full of incredible magic and well described sleight of hand. It's real value is in him taking the student from his basic concept through his creative process and why he made the decisions he did. It's a master class from a masterful professional. The tips regarding how he methodically made his act better through focus group testing was worth three times the cost of the lecture. The business tips on getting and keeping a restaurant gig make this a must view for anyone interested in seriously working as a magician. I was in the audience during the lecture, and couldn't take notes fast enough. This is one of the more valuable lectures on the market. It was practical in professional work. The part of the Rubik cube is also very clever. John George walks through his routine in a clear unassuming manner. His sleight of hand is flawless and the explanation is down to earth and easy to follow. Throughout the lecture he makes note of variations that can be used and suggestions of how to perform in a variety of settings. I've been a member of Penguin for years and am very impressed with the quality of lectures they offer. John George certainly does not disappoint, and I would highly recommend it to anyone interested in close up magic. There was an 8 minute competition style performance, which concludes with the cups (seen in trailer), at the start followed by a very long explanation of those 8 minutes. It was an amazing act, obviously, because it won several awards. I learnt a bunch from this segment of the lecture. There is a bunch of explanations about the jacket loads and modifications and things that have gone wrong in the past that lead to what he has. This was amazing to me as I've done no work with loads. This is followed by some great material which are shown as individual pieces with clips from a previous show. These include some cube magic, coins, ambitious-to wallet routine. They all have some great tips and points but were not anything new for me. This is all followed by some individual slights and some of this was quite useful. And the usual interview at the end with Harlan was great. I loved his explanations and the way he communicates. Was fast paced and funny when performing and slowed down for explanations. Only bad point - It slowed down a lot after the competition performance and became individual tricks.